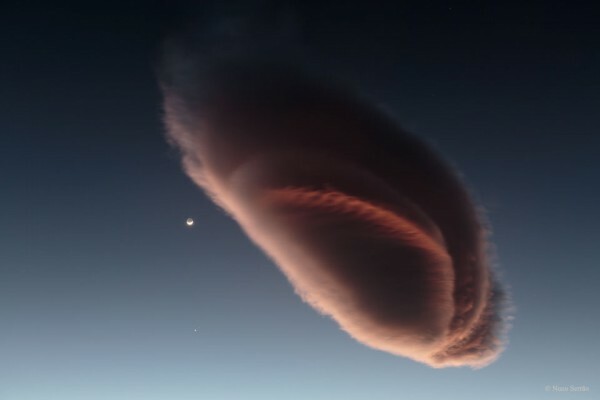 The beauty of this picture is not just the huge lenticular cloud red reflex by sunset, no. The nice thing about this photo is the moon and Venus clearly observed. Regarding the lenticular cloud, you know that these things make me, are typical high clouds happens when there is no wind. They are formed by a stream of hot air rising that raises the existing water vapor in the air condenses with that. It is simple. Hot air rises with the water vapor up, way up, it cools and condenses the water. So cool that way there is no wind, it is. They contain “rain” or cause anything, are just beautiful and indicate the current warm up, which, depending on how walk the rest, it may be important to know if it will be hot or not.